Out of home tea is the tea that is consumed outside the home in quick service restaurants, restaurants, bars and pubs, hotels, cafés, work places, and various other outdoor venues. These teas are of different types and flavors which includes green tea, black tea, herbal tea, oolong tea, and Matcha tea. Black tea is processed from Camellia Sinensis plant and is often blended with other plants for different flavors. Black tea is one of the most preferred and consumed beverage in the world due to presence of antioxidants and compounds that helps in reducing inflammation in the body. Green tea being native to China is also made from Camellia Sinensis and is hailed for its health benefits. Green tea is used as traditional Chinese and Indian medicine to control bleeding, heal wounds, and improve heart ailments etc. Green tea also has positive effects on weight loss, type 2 diabetes, and Alzheimer's. Herbal teas are known as herb teas or tisanes and are prepared from a mix of herbs, fruits, and spices in hot water. Matcha tea is finely crushed powder of fully grown and processed green tea leaves. Oolong is traditional Chinese tea manufactured by crushing the plant under strong sun and oxidation before curling and twisting. Based on packaging type, the out of home tea market is segmented into loose tea, bottled tea, tea bags, and canned tea. Dried and crushed tea leaves are packed in individual teabags or sachets. Packaging of such tea bags is done in such a way that it is convenient to use anywhere. Bottled tea and canned tea that is packed in bottles or cans is made by the brewing process and stored in cool places. They are generally consumed as ice tea. These teas are primarily found in quick service restaurants, restaurants, cafes, bars and pubs, and work places. According to end-use, the market can be segmented into quick service restaurants, restaurants, hotels, bars & pubs, café/coffee shop chains, work places, outdoor, and others. Based on geography, the market is segmented into five regions namely, North America, Europe, Asia Pacific, Middle East &Africa, and South America. 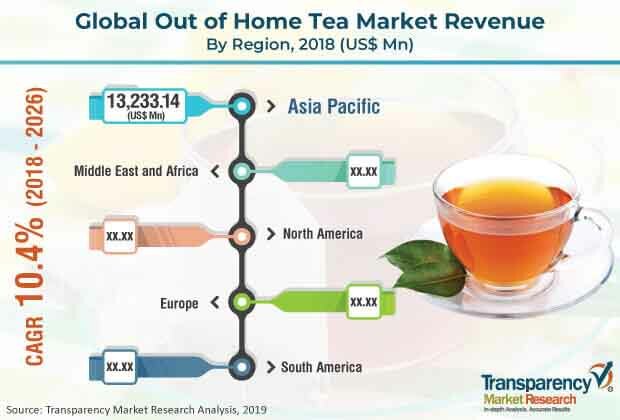 Asia Pacific held the dominant share in the out of home tea market due to popularity of tea as a convenient beverage, and changing scenario of restaurants, cafes, and retail stores. The global out of home tea market is estimated to expand at a significant growth rate between 2018 and 2026 due to increasing usage of tea for outdoor consumption coupled with a variety of tea offerings by manufacturers other than the usual English breakfast tea and Earl Grey tea. Consumers are paying greater attention to factors such as origin of tea, health benefits of drinking tea, and tea blends etc. that is driving the demand for out of home tea. This in turn is forcing more cafes and restaurants to invest in a variety of tea varieties to offer more options to consumers. Increasing popularity of tea as a convenient beverage along with changing scenarios of retail stores, signified by the popular Starbucks and Dunkin Donuts opening their tea outlets and incorporating customization in their products is driving the growth of the out of home tea market. Major players of the out of home tea market profiled in the report include Tata Global Beverages Ltd., Costa Ltd., Celestial Seasonings, Inc., Nestle S.A., The Republic of Tea, Tenfu Corporation, Bettys and Taylors Group Limited, Kusmi Tea, Peet’s Coffee & Tea, Unilever Group, Starbucks Corporation, The Coca-Cola Company, PepsiCo, Inc., Associated British Foods, and Dilmah Ceylon Tea Company Plc. The out of home tea report provides analysis for the period 2016–2026 wherein the period from 2018 to 2026 is the forecast period and 2017 is the base year. The report covers all the major trends and technologies expected to play a key role in the out of home tea market over the forecast period. It also highlights the drivers, restraints, and opportunities expected to influence the market’s growth during the said period. The study provides a holistic perspective on the out of home tea market throughout the above mentioned forecast period in terms of revenue (in US$ Mn and Thousand Kgs), across different geographies, including Asia Pacific, South America, North America, Europe, and Middle East & Africa (MEA). The market overview section of the report demonstrates the market dynamics and trends such as the drivers, restraints, and opportunities that influence the current nature and future status of this market. An attractiveness analysis has also been provided for every geographic region in the report, in order to give a thorough analysis of the overall competitive scenario of the out of home tea market, globally. Moreover, the report provides an overview of the various strategies of key players present in the market. Product definition chapter helps in understanding different tea types and packaging types of tea along with their end-use segments which are included in the report. The report segments the global out of home tea on the basis of type, wherein the market is segmented into green tea, black tea, herbal tea, oolong tea, Matcha tea, and others. Furthermore, the market is classified by packaging type into tea bags, loose tea, bottled tea, and canned tea. By end-use, the market is segmented into restaurants, quick service restaurants, hotels, bars & pubs, café/coffee shop chains, work places, outdoor, and others. Thus, the report provides in-depth cross-segment analysis of the out of home tea market and classifies it into various levels, thereby providing valuable insights at the macro as well as micro levels. The report also highlights the competitive landscape of the out of home tea, thereby positioning all the major players according to their geographic presence and recent key developments. The comprehensive out of home tea estimates are the result of our in-depth secondary research, primary interviews, and in-house expert panel reviews. These market estimates have been analyzed by taking into account the impact of different economic and consumption factors along with the current market dynamics affecting the growth of the out of home tea market. On the basis of country, the North America market is divided into the U.S., Canada, and Rest of North America. Similarly, the Europe market is divided into the U.K., Germany, France, Italy, and Rest of Europe. Asia Pacific has been segmented into China, Japan, India, and Rest of Asia Pacific. Middle East & Africa covers G.C.C., South Africa, and Rest of Middle East & Africa. Similarly, South America region includes Brazil and Rest of South America. This report provides all the essential information required to understand the out of home tea and its types. Furthermore, Porter’s Five Forces analysis explains the factors which are currently affecting the out of home tea market. This report also provides the value chain analysis for the market, which explains the participants of the value chain. Tata Global Beverages Ltd., Costa Ltd., Celestial Seasonings, Inc., Nestle S.A., The Republic of Tea, Tenfu Corporation, Bettys and Taylors Group Limited, Kusmi Tea, Peet’s Coffee & Tea, Unilever Group, Starbucks Corporation, The Coca-Cola Company, PepsiCo, Inc., Associated British Foods, and Dilmah Ceylon Tea Company Plc. are some of the major players operating in the global out of home tea market profiled in this study. Details such as business strategies, recent developments, and other such strategic information pertaining to these players have been duly provided as part of company profiling. The out of home tea market is segmented as below.